We're big fans of the Cosatto brand in our house. Bright, bold, often unisex and functional! We've been lucky to test out one of their Supa strollers and one of their fantastic car seats. Neither of those items compare to the excitement in the house when a Story Cotbed arrived on our doorstep! We had to wait until the weekend to get the cotbed set up so I had a few days of poking, prodding and peeking into the boxes, desperate to get the cot set up and in use! "One of the best things about this cotbed is the way all of the items needed for construction have been packaged, in one clear labeled package. This made it a lot easier! I found the instructions reasonably simple though perhaps a few more images might have been handy. 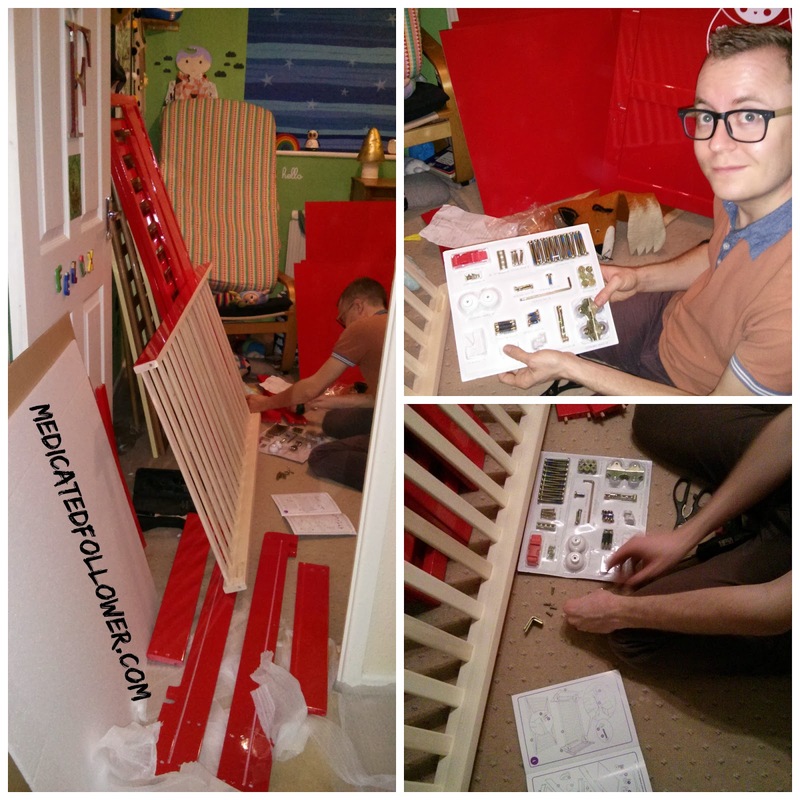 Putting the cot together was quite simple. It took a while because I wasn't able to use my electric screwdriver, it wouldn't fit into the tight angles. That made it a bit more effort and take a bit longer! I like how sturdy the cotbed is though and it's a lovely bright colour! My only criticism would be the amount of packaging used. Obviously you want the cot to be safe during storage and transit but we ended up with 6 bin liners full of polystyrene which is currently non-recyclable. My suggestion for Cosatto would be looking into some other types of packaging, something a little more green if that's possible." So, in Pete's opinion, overall, fairly easy to construct, instructions were quite clear and the tools needed were very easy to find. He felt the wood is of excellent sturdy quality. Just a small down side when it comes to all the packaging that has to be thrown away. 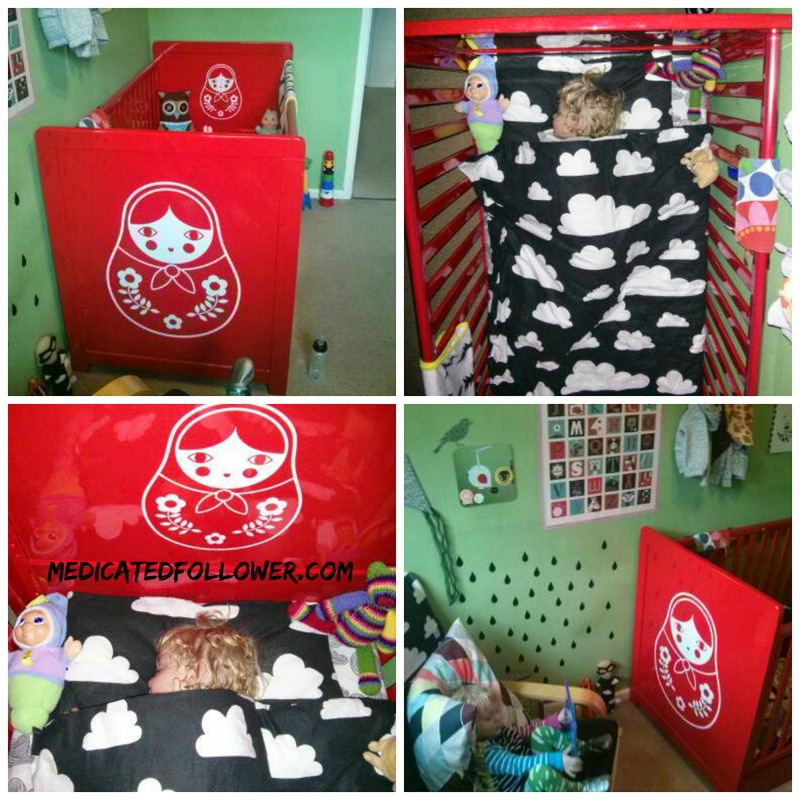 "The Story Cotbed grows from a cot with a changer to junior bed to sofa. Story's chapters are endless"
There you go! With this cotbed it's easy to see you'll be sorted for years. I especially love that you can use it as a sofa once your children have grown out of it. 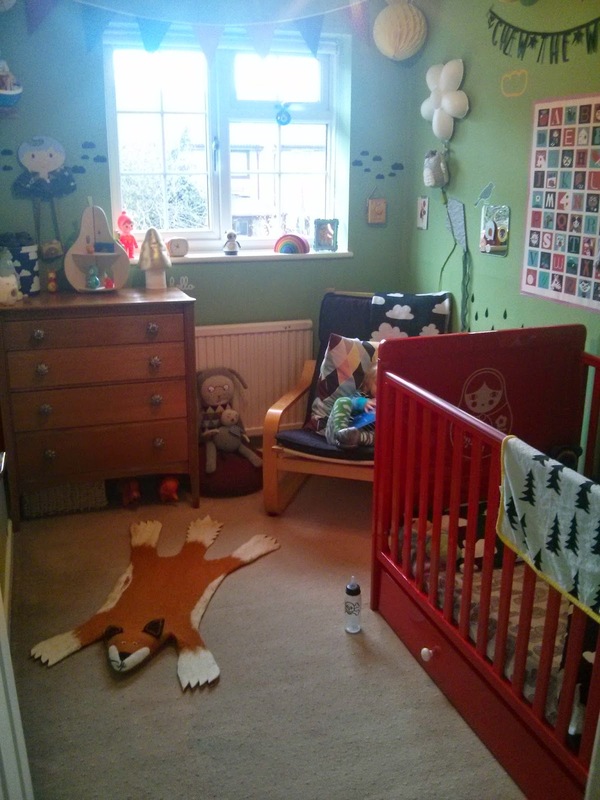 When my boys are a bit older they might well want to share a bedroom, freeing the other room up to be a play room. At that stage we might well put story in to sofa mode so they have somewhere to chill out on! I think we'll get years of use out of this! What do I like about it? Well, first of all, you can't miss it. It's eyecatching. I love the Babushka doll printed on the ends of the bed. You get a little closer and you can see and feel the quality. This is a good solid piece of furniture. The fact there are three levels for the matress is essential for me. Felix is a good climber and it's hard to keep him one place. The lowest setting has even him stumped! My children are both chewers - Ethan wrecked the sides of our previous cot by chewing on them. Felix hasn't been as bad but it's nice to know he won't be able to do so with this one! A favorite feature for me would be the extra storage you get with the draws underneath. Firstly, it's such a good use of space. Felix's bedroom is quite small and we only have room for a chest of draws in there, no wardobe. With these draws we now have space to store his spare bedding and clothing. It's wonderful! We won't be using the changer with Felix as he's 18 months old and such an active kid it's very much easier to change him on the floor but I do think it's a fantastic idea and would be great with a young baby. Another great space saver. Does Felix like it? I'd say so! He was very excited when he saw it in his room, he's really attracted to the bright colour and chats to the dolls on the ends of the bed. I can't say that the cotbed has solved his sleep issues, but then I wouldn't expect it too!!! At least I know he is safe and comfortable in there though. All in all, it's hard not love this cotbed. The fact it's such great quality and will last such a long time. Retailing at £410 it isn't a small purchase but it is good value for money, especially if you are able to use it for more than one child. Using it for several children and finally using it as a sofa you'd get years and years out of this! It gets our seal of approval! By the by, do you like the gorgeous Farg Form cloud print bedding? It was very kindly provided by This Modern Life who stock some amazing kids bedding - great for jazzing up your Cosatto Cotbed!! 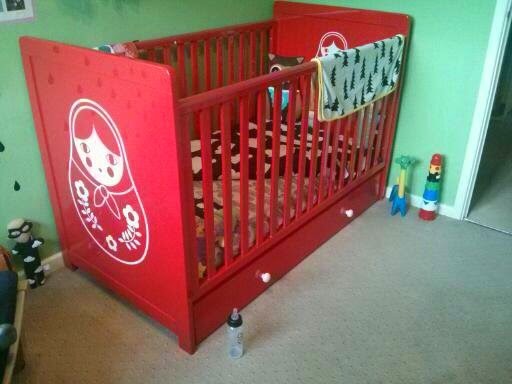 I think that has to be the most beautiful cot I have ever seen! If we have another, I will definitely be checking them out.